It’s an unavoidable truth. If your child wants to fight crime, then they need a cape. It’s one of the many defining rules of being a superhero! After all, the common citizens won’t take your child seriously as the newest superhero on the block if they’re not wearing the uniform of a superhero. And what’s the number one piece to a superhero uniform? You guessed it. It’s a cape. A cape lets your neighbors know that your child is there to save the day! Without it, they might just think that your child is up to no good when your young one is dashing through the neighborhood. So, your first order of business should be to get one in your child’s favorite color. This blue superhero cape helps transform your child into an official superhero! The bright blue color is the perfect accent to many of our superhero costumes. It has neck ties for easy fitting. You can even just pair it with some of your child’s normal clothes to create a brand new kind of superhero look. 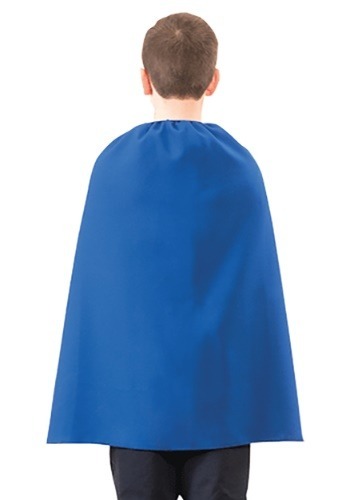 This cape might not actually give your child superpowers, but it does present an easy addition to add to your child’s costume to make them look more like his favorite comic book character.